Once upon a time, I was a blogger. Then I was pregnant, which I found more exhausting than I had ever imagined. Then I had a baby, and redefined tiredness. First we had the jaundice, then the thrush, then the growth spurt, then a cold, then the sleeping 'problem' (a slight disagreement as to where she should sleep. I thought the moses basket by the side of the bed, she thought in our bed, I won, and now we're both a lot happier because we're both sleeping better, and I now have evenings with both hands free). This week it's first round of immunisations, so I'm braced for storms, Calpol at the ready. Ladies and gentlemen, if anyone's still reading, I present Miss Elizabeth Sovay Upton (google Sovay if you're not a 1970s folk rock fan). Two months old now, and a lady of decided likes (mostly milk) and dislikes (having her face washed, being ignored momentarily, being weighed). She was 8lb 5oz on the second of November, when she eventually emerged, 10lb 6oz three weeks ago at her last weighing, and certainly rather more now. 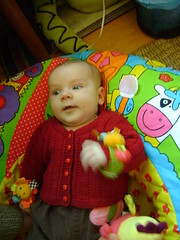 The cardigan is one of the two I managed to knit for her whilst pregnant; mostly, her granny keeps her in knitwear. I do milk. And more milk. And still more milk. And yes-I-can-still-be-hungry-give-me-milk-NOW. It's just as well my housekeeping standards were low; they're practically non-existent now. And we love her, because she's wonderful. Such a lovely post! I can relate alot -especially to the constant feeding and completely ditching the housework!